CM Vasundhara Raje’s Rajasthan Gaurav Yatra is moving ahead with great zeal. It is 40-day yatra which began on 4th August. During this yatra, CM Raje will cover 165 out of 200 constituencies. 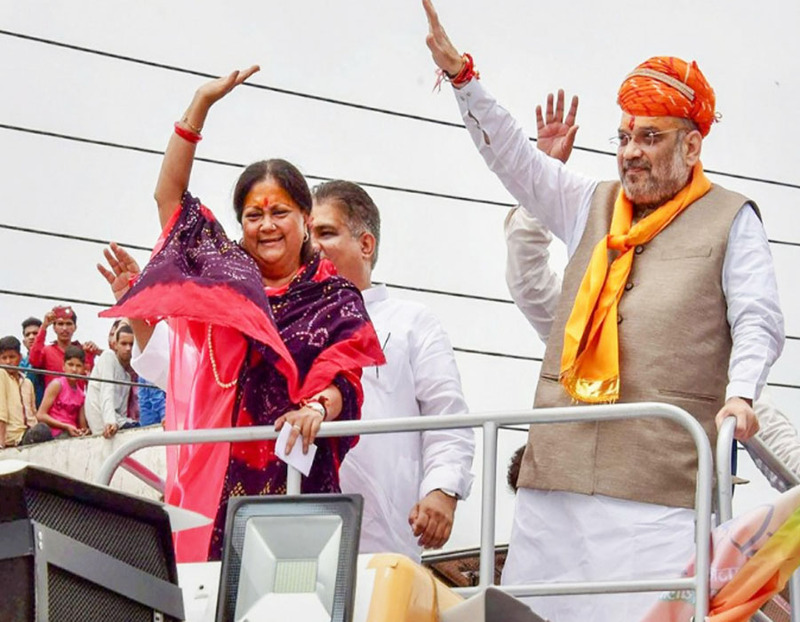 As per the agenda, she reached Banswara on the third day of yatra. CM Raje is in Banswara for three days. Chief Minister was welcomed by party office bearers and workers. On the first day at Banswara, she addressed the General Assembly at the playground of Garhi. After this, her welcome was held at Paratapur, Bajwa, Talwada and Kupda. On the second day, she visited the Tripura Sundari temple via helicopter. Later, she visited Monadungar, Bhilkuna, Sajjangarh, Dungra Bada, Dungra Chhota and other places. She went to several nearby places and will return to Banswara in evening. Talking about the third day, her chariot will pass by college ground, Ambamata temple, custom square, old bus stand, Gandhi Murthy, Hospital Chowrah, Mohan Colony and finally go out for Ghatol. To avoid any kind of inconvenience during yatra, Banswara district collector Bhagwati Prasad has been doing the preparations. He has also appointed Dr. Bhanwarlal, District Council CEO as Nodal Officer and ADM Himmat Singh Barhath as Co-Nodal Officer for necessary arrangements. She got great welcome at many places in Banswara. She also held public address at many places and will further address in the district. CM invited people to support BJP in the state. She also asked to be part of yatra and make it successful. In fact, she shared that BJP always bring prosperity and development to the state.